The lens in the eye starts life clear. With age it becomes increasingly cloudy. The condition of having a cloudy lens is called cataract. Everyone has some degree of cataract, and these get worse throughout life (rather like having gray hair). In the early stages of cataract, glasses can help work around the cloudiness. Eventually, surgery is necessary to remove the lens and replace it with a synthetic, clear one. 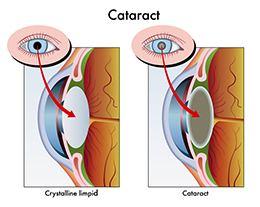 Cataracts happen to most people with age, and can also happen in younger people with eye diseases such as uveitis. Surgery on these patients is considerably more complicated, and is an area in which we specialize.